Over the past year or two, I've been through somewhat of a hair renaissance. I spent years hating my natural curls, wishing my texture away in favor of a glossier, straighter variety. "You always want what you can't have," was a phrase that plagued my entire existence. Growing up, my mother thought I was crazy, constantly adulating my curls and forbidding me from straightening them. Thank god she did because now they're one of my most cherished attributes. I went from straightening my hair, to clipping in extensions each day for almost a decade, and to blow-drying and curling each strand every morning. Finally, I gave up and accepted my fate as a puffy, frizzy-haired human with curls that are anything but uniform. Truth be told, I've never felt more like me (or gotten as many compliments). My one vice, though, that remains throughout all of this is my affinity for bright, cool-blond highlights. I color my hair a lot and while it's great for my look, it's pretty terrible for the health and definition of my curls. After my most recent appointment, I noticed a ton of breakage, split ends, dry patches, and really uneven length. I was distraught—but, what could I do? I reached out to my hair guru over at the John Barrett Salon at Bergdorf Goodman, Halli Bivona, for advice. Keep reading to find out how (with her sage advice) I revived my devastatingly overprocessed hair. "The best thing for overprocessed hair is to get the elasticity back into it," Bivona began. "Protein treatments like Milbon Linkage Meu can be done in the salon ($150, including a blowout)—it restores proteins and collagen to help rebuild the hair from the inside out." Afterward, I got a set of four for $8 on Amazon and used an ampoule each week for four weeks to extend the benefits. And boy, were there benefits. When the month was over I felt my hair coming back to life. It was silkier, smoother, shinier, seemingly stronger, and definitely more moisturized. But it wasn't back to its former self just yet. "A good haircut will also help hair that has had a bit too much chemical processing. The cut will take off any split ends that may travel up the hair and wreak more havoc." So, I headed over to Bivona for my first cut in almost two years. Yikes, I know, but my hair grows slowly and haircuts make me nervous. Like the angel that she is, Bivona dusted my ends without removing barely any length and I left with an awesome cut and zero split ends. "Getting moisture back is key," Bivona explained. 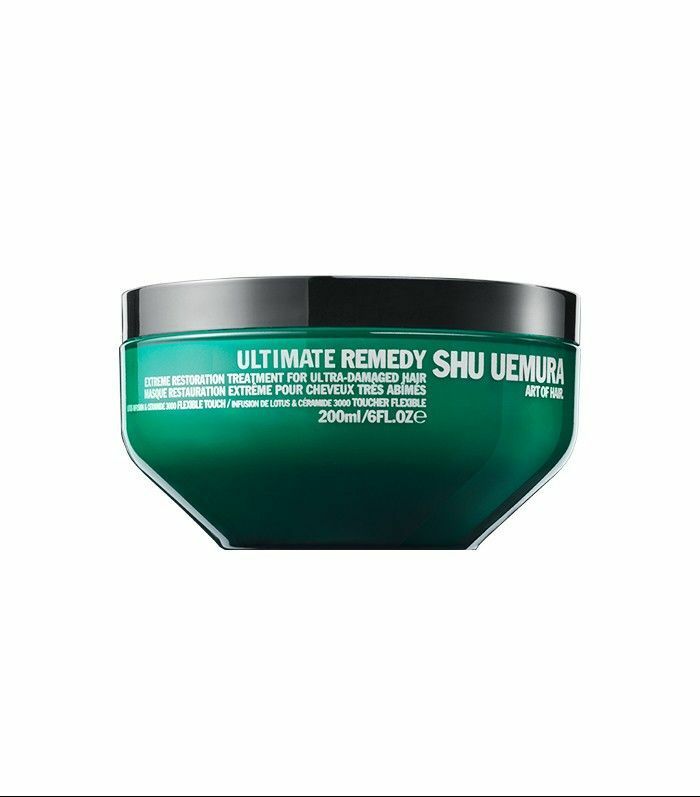 "Replace your daily conditioner with a mask—I love Shu Uemura's Ultimate Remedy Extreme Restoration Treatment ($68). This way, you're putting in the maximum moisture with every wash. I recommend leaving it in up to 20 minutes and then rinsing thoroughly." This is also Byrdie associate features editor, Amanda's go-to mask. She raves: "What makes the formula special is that it works to bind the hair cuticle and cortex, making your locks not only soft and shiny, but physically stronger as well. For colored hair, I consider this an absolute essential." This mask absolutely delivered. I used it in lieu of conditioner each time I showered for a month. It's a totally game changer in terms of hydrating, softening, and strengthening your hair. Plus, it smells absolutely divine. After finding such success with the Shu Uemura mask and in-salon treatment, I was addicted. I decided to try a few more beloved offerings in search of even more noticeable results. I searched back through my desk drawers to find a treatment I had been meaning to try but never got around to applying. 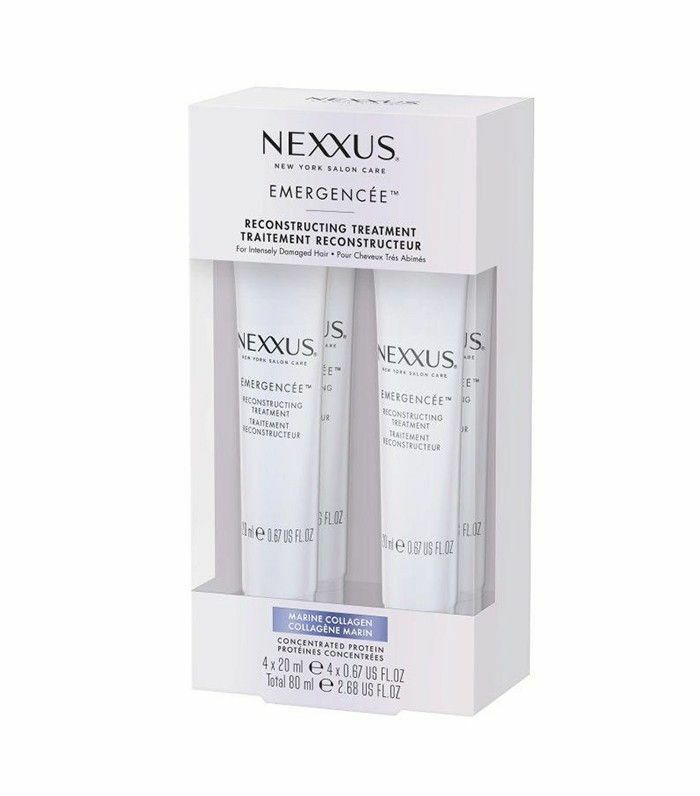 Lona Vigi, a celebrity hairstylist with clients from Selena Gomez and Nicole Richie to Drew Barrymore and Cameron Diaz, suggested I try Nexxus's Emergencee Repair Reconstructing Treatment ($19). The small tubes are each concentrated with marine collagen and elastin to increase the hair's strength and manageability. The formula is then mixed with proteins to actively penetrate the hair fiber and repair the structure of each strand. Meant to dramatically reinforce the hair cuticle wall, these once-a-week doses did wonders for my curls. My hair felt like silk for days after each one. That, and the results are cumulative. Now, after using all four, my hair is practically back to it's pre-color moisture, thickness, and strength. Bivona added, "Try using either camellia oil," which is a prominent ingredient in my absolute favorite post-shower serum, "or coconut oil daily on wet and dry hair to introduce moisture and protect your hair from any more damage." After using each of the products religiously, I thought it wise to also put off my next color appointment. 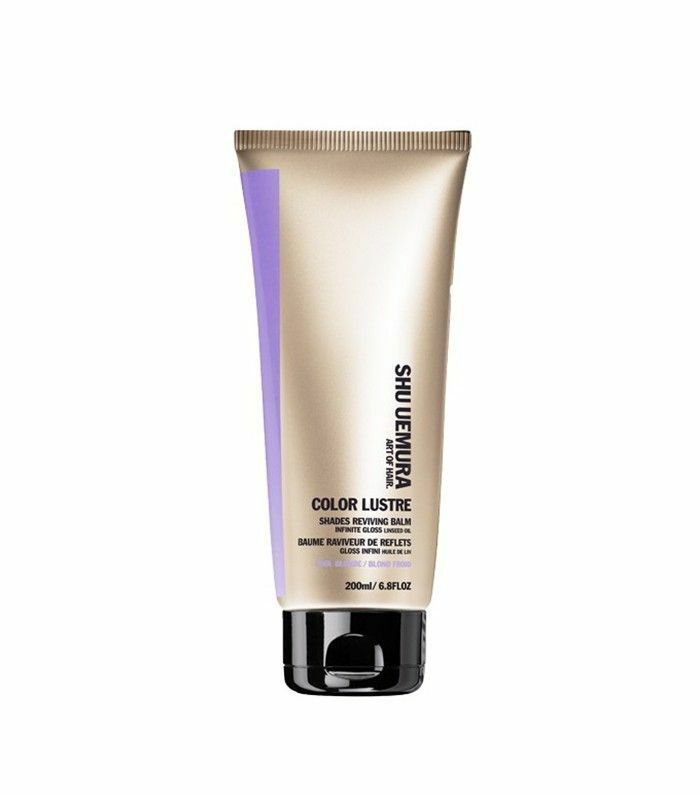 To keep my hair bright and my roots at bay, I invested in Shu Uemura's Color Lustre Cool Blonde Shade Reviving Balm ($58). It works to balance my cool-toned color and keep brassy tones to a minimum in-between highlights. The genius is in the formula which subtly deposits color while canceling out unwanted yellows. plus nourishes hair to leave it even healthier and more vibrant than before. I use it in the shower instead of shampoo once a week starting at the midlengths and working towards the ends. Then, I keep it in for the rest of the shower (at least 10 minutes) and rinse before toweling off. Want celeb-worthy hair? Peek inside the crazy life of a celebrity hairstylist for shocking stories and priceless tips.